I don’t usually post about my day-to-day eating. It’s usually fast, tasty and not so pretty looking. I’m all about the end product, heck, I’ve been known to eat things straight out of the pan! That’s why I generally post about my baked goods. You eat one or two (or a dozen) and then get to work photographing the rest. I can take my time angling my cookies or slices of cake ‘just so’. But with dinner? No, no, no, no – I gotta eat. Now. But I was struck by the beauty and simplicity of my dinner tonight and was inspired to capture it for all to see. 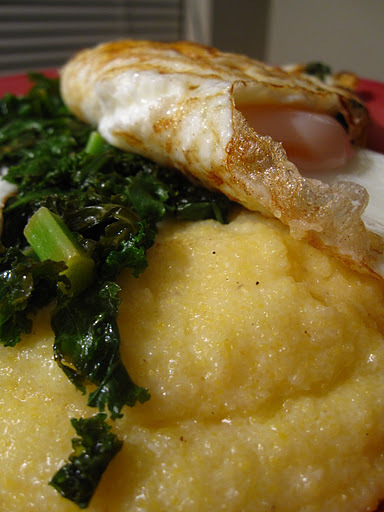 Creamy polenta topped with sauteed kale and a couple of fried eggs! I started the polenta first: 1/2 cup cornmeal + 1 cup water + 1 cup milk. Bring to a boil over medium and keep stirring until thickened – this takes about 5-8 minutes or so. Add in salt, pepper and grated cheese to taste. At around the halfway point, throw your eggs on one side of a frying pan and a couple of handfuls of kale on the other side. Throw the lid on for a couple of minutes. All of it should come together around the same time. This is such an awesome post. I'm always on the lookout for cheap, easy dinner ideas and this one looks pretty delish! I like how it's kinda Asian with the fried egg, and kinda Western with the polenta.